Cruise ship Empress of the Seas reportedly got caught in Hurricane Michael’s outer bands, CNN reported. 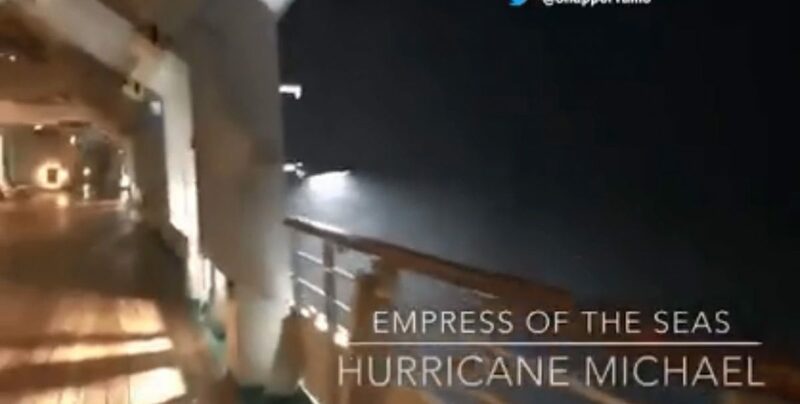 Snapper Tams, a passenger on the Royal Caribbean ship, posted video footage of stormy seas, heavy rain, and harsh winds. He said the ship sat for a few hours as the storm moved through the Yucatan Channel in the Gulf of Mexico. There were no reports of damage or any injuries, but Tams said that some people got seasick. According to the U.S. National Hurricane Center’s latest update on Oct. 9, Michael is continuing to strengthen. 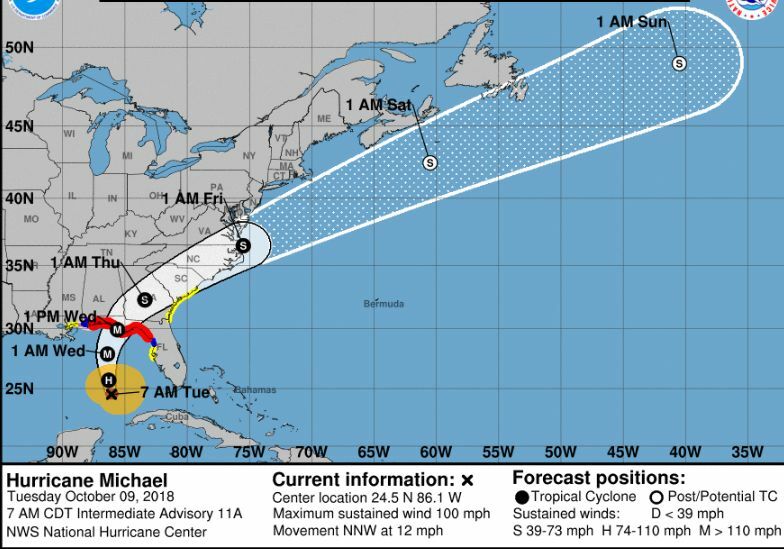 It currently has 100 mph winds and is moving north-northwest at 12 mph in the Gulf of Mexico about 395 miles south of Panama City, Florida, and about 365 miles south of Apalachicola, Florida. The storm is threatening the Florida Panhandle with life-threatening storm surge, heavy rains, and hurricane-force winds, the NHC said. The storm is predicted to hit the Panhandle at around 1 p.m. ET on Wednesday, Oct. 10. A hurricane warning is in effect for the Alabama/Florida border to Suwannee River in Florida. A tropical storm warning is in effect for the Alabama/Florida border to the Mississippi/Alabama border as well as the Suwanee River in Florida to Chassahowitzka in Florida. A storm surge watch is in effect for Anclote River in Florida to Anna Maria Island in Florida, including Tampa Bay as well as the Alabama/Florida border to Okaloosa/Walton County Line in Florida. A hurricane watch is in effect for the Alabama/Florida border to the Mississippi/Alabama border. A tropical storm watch is in effect for Chassahowitzka to Anna Maria Island in Florida, including Tampa Bay; Mississippi/Alabama border to the mouth of the Pearl River; and Fernandina Beach in Florida to South Santee River in South Carolina.